A booklet published in 1994 by Kathleen Brown, a member of the Chapel, gives useful information. I am also in possession of notes written in 1988, also presumably by a member of the Chapel. I have used both to help put together these notes. That Booklet refers to there being an earlier chapel in the village and I have researched this point at some length as will be seen. The most helpful document from this aspect was The Northallerton Record Office Document No. Z 747 Stillington Histories of all Freeholds (1767 to 1820), that I have marked (2). Finally, a notebook written by G.C.Cowling of Easingwold that can be found in the York Reference Library, gives further detailed information and references to sources. Where used this is marked (3). In the absence of knowing where the writer of the Booklet saw this document, I have assumed that it is referring to the chapel in Main Street mentioned in the preceding paragraph. The reason being that both documents mention the name of George Walker as being the owner. 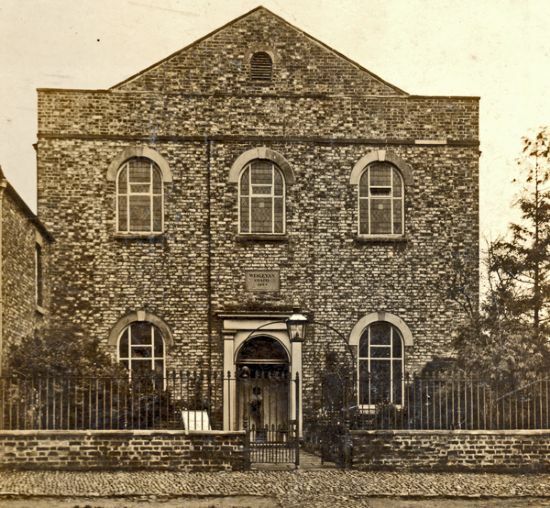 This is supported by Cowling who states “There was a school attached to the chapel in 1859." (He quotes his source as being Whellan & Co). In 1890 and 1901 this school was attended by some 50 children. Its capacity in later years was 70. The master in 1890 was James E. Charnock and in 1901 Albert Stafford. (Kelly’s Directories). Charles Hutchinson, a Stillington resident for some years, told me that he could record this as being in use for religious services in 1931 as he went to one or more at that time. (Charles told me this on 30.3.2009). He also went on to tell me that it ceased to be used shortly afterwards and became a cycle repair depot operated by Mr.Morse. During the 1939/45 War it was used to store waste newspapers for the war effort. The building was pulled down after the 1939-45 War in order to widen the road junction. This Chapel is not listed in the above Stillington Histories of all Freeholds circa 1767-1820, which tends to confirm that it was not built until after that date. However as far as I can make out from that list the property on the site was owned by William Wilkinson from 1771 to 1819 when it passed to Thomas Wilkinson. 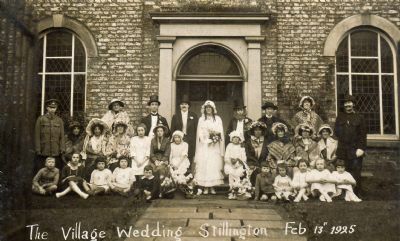 Mock Wedding 13/2/1925 at The Methodist Chapel in Main Street. 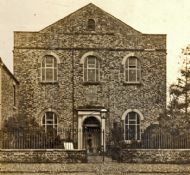 The Old Methodist Chapel in Main Street date unknown. Pictures of the Wesleyan Chapel are quite rare so we are very lucky to have this small selection. 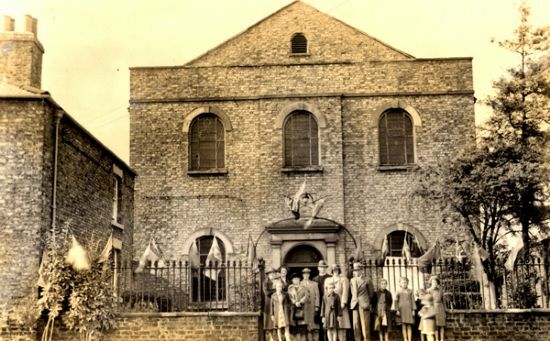 Celebrations for the Centenary of the Chapel in 1944. This image shows just what a magnificent building this chapel really was, towering over the neighbouring house. Note the Hall to the right of the picture, this has been converted to form the new Chapel. 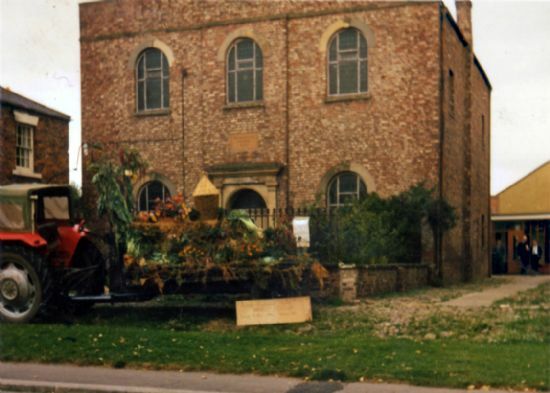 The existing old Chapel was demolished in 1972 with new houses and flats being built on the site. 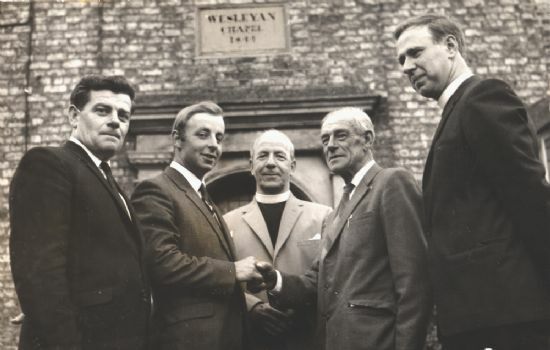 Left to Right: Les Salton, Robin Jackson, Reverend Bernard Crosby (circuit Minister), Frank Fothergill, Reverend Graham Eddy (Minister of section).